Frame your large window with this extra-wide faux silk curtain. 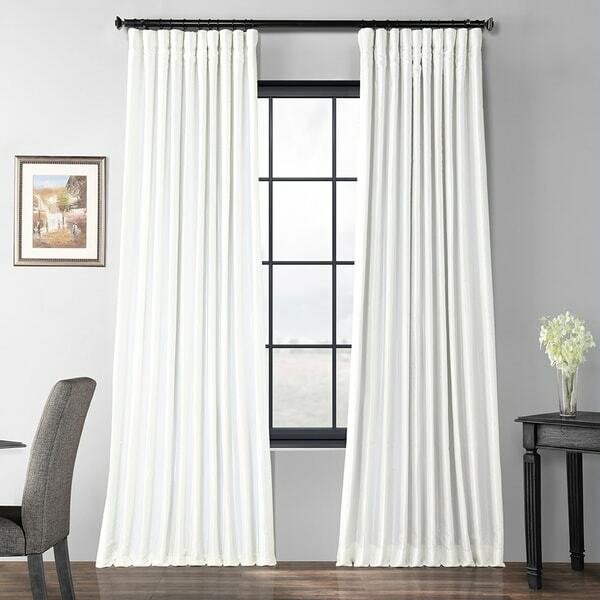 Featuring a blackout construction, this white curtain is perfect for your bedroom or any room where you take naps. We love these curtains! We purchased them for our bedroom. They are bright white and are perfect for the space. They do a better job of blocking out the light than I expected for the price. They are a great value for a great price! The fabric was high quality and a beautiful color, as shown, on the website. I had to return them because they didn't have the back tabs, as had been specified on the site. I ordered the other extra wide curtains that had the back tabs instead. These are very nice quality, well made faux silk drape. Window coverings can be so expensive but these are reasonably price and look higher quality than the price would indicate. I guess these are ok, but they're very thin and didn't look like a crisp white to me. "Can u push these curtains all the way to the side or is the lining too thick to open all the way? I don’t want to block my view." We suggest you allow for approximately 24" on your rod past the window per panel to fully expose the window since these are very wide curtain panels. You may also want to consider using a tie-back to assist holding the panel to the side. "Also, what’s the exact width?" The panel is 100 inches wide. "Is Gleaming Sugar white white?" Yes, it is a bright white. "is the lining also white?" The lining is a soft white. "Is the gleaming sugar blackout (very very dark)? " Yes, with the thick blackout lining these will darken rooms. This listing is for a single panel.